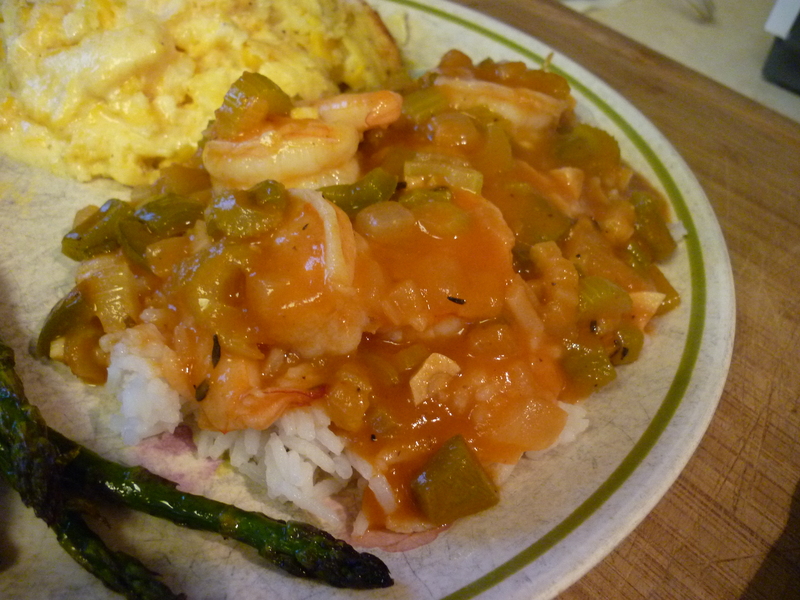 I really like Shrimp Etouffee. 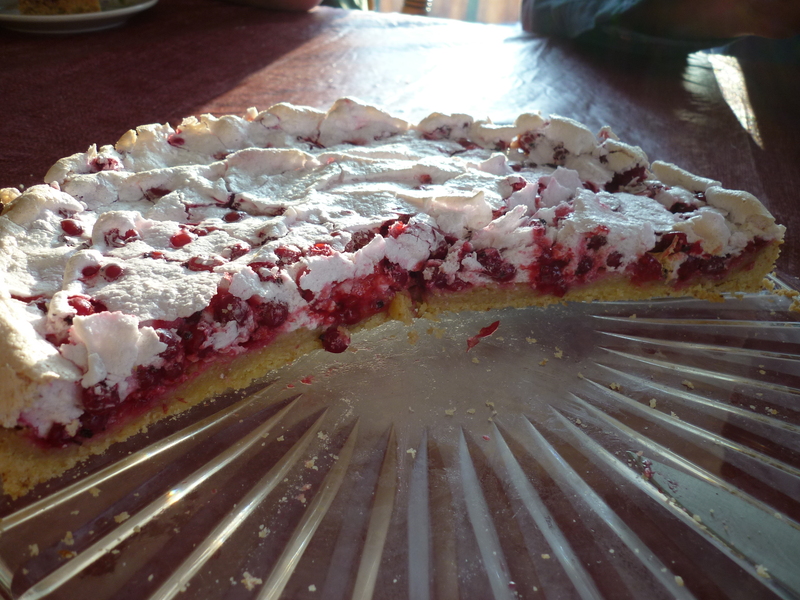 This is a recipe I found at Cooking Melangery, which is a great website with wonderful pictures and unique recipes. 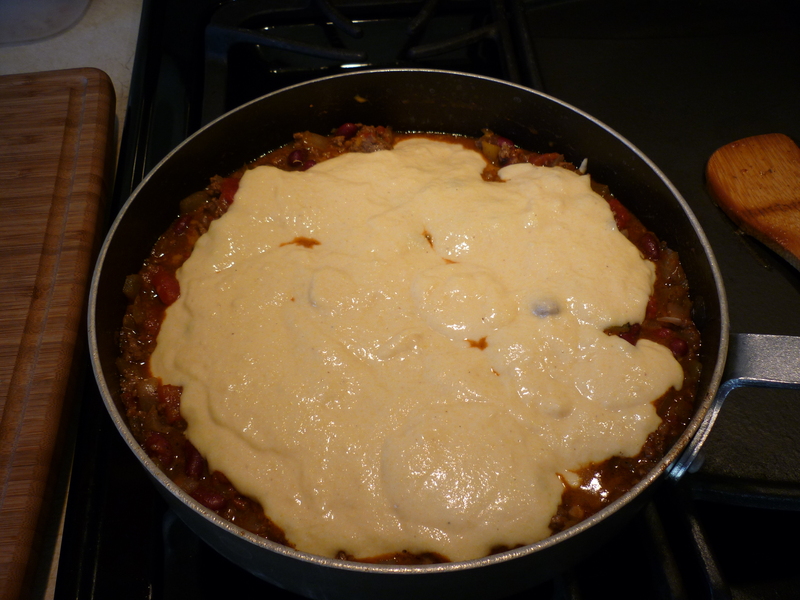 Heat a large skillet or Dutch oven and add the oil and flour. 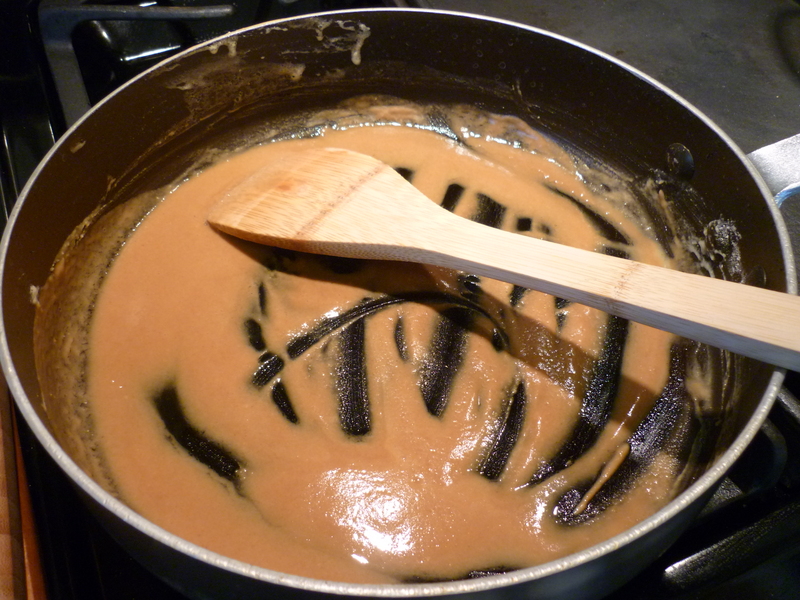 Toast this to a peanut-butter-colored roux. This should take about 10 minutes over medium heat. Be careful not to burn this. Stir often. 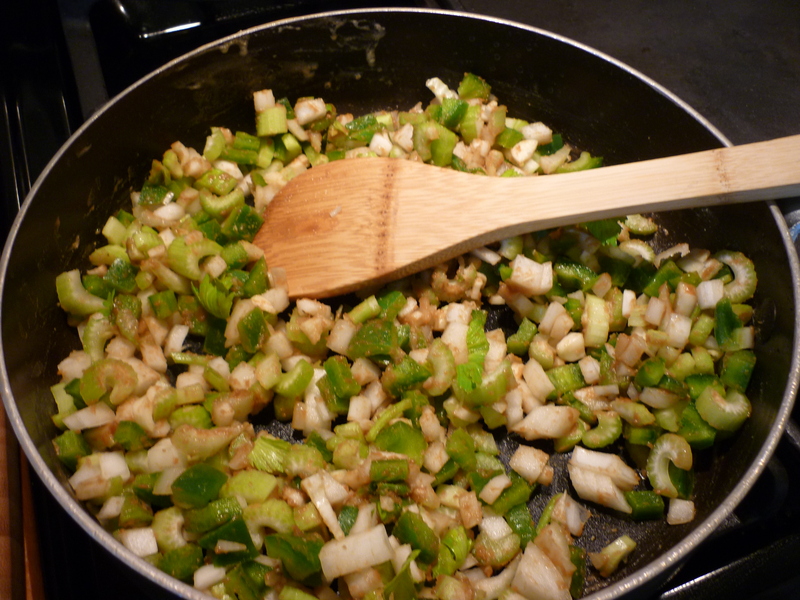 Add the yellow onion, bell pepper, celery, and garlic. Saute for about 10 minutes or until the vegetables are tender. 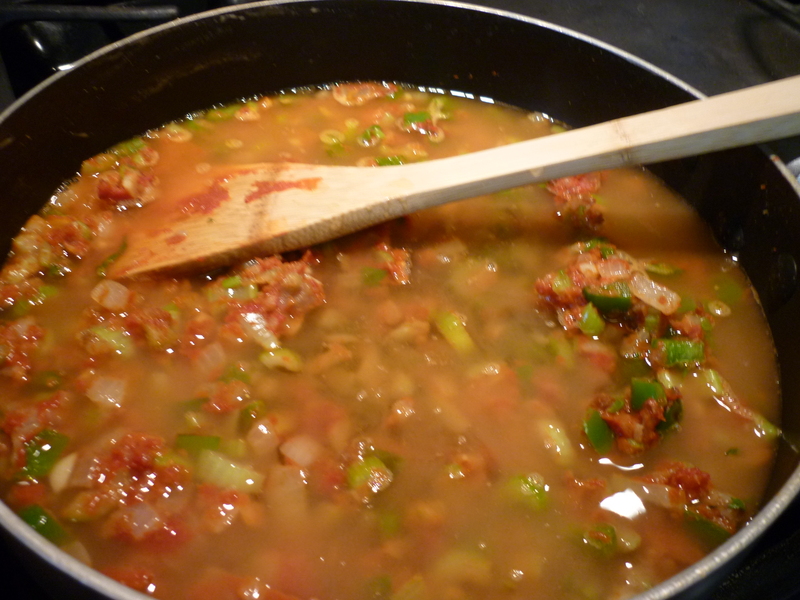 Stir in the tomato paste, followed by the broth and wine. 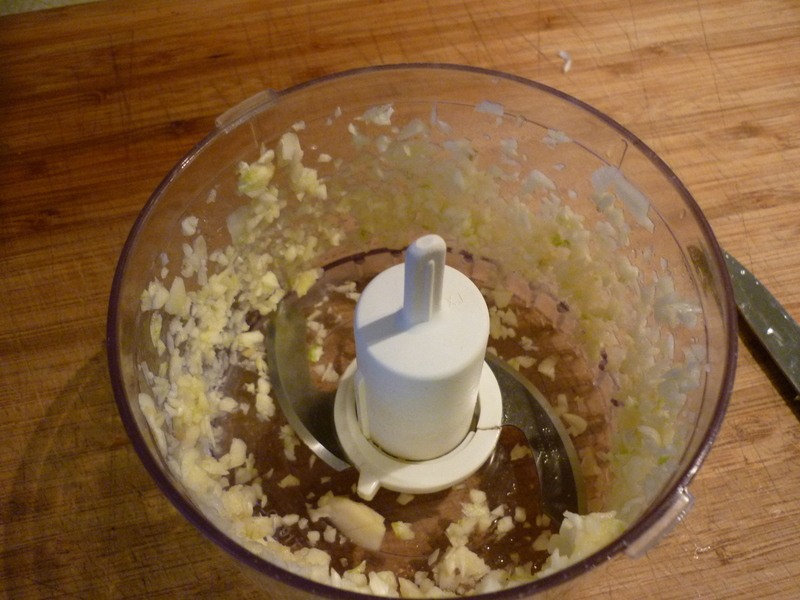 Stir constantly until this mixture thickens. 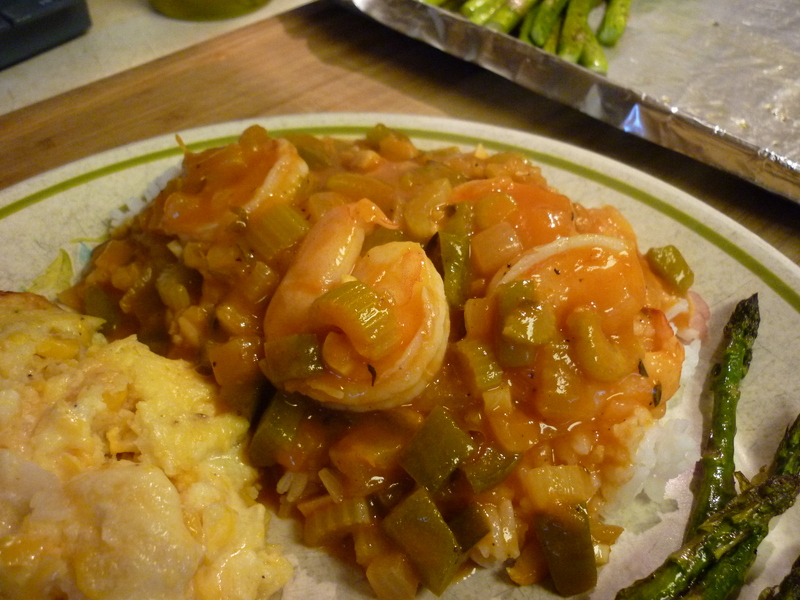 Add the remaining ingredients, except the shrimp, and rice. Simmer, covered, for about 30 minutes. 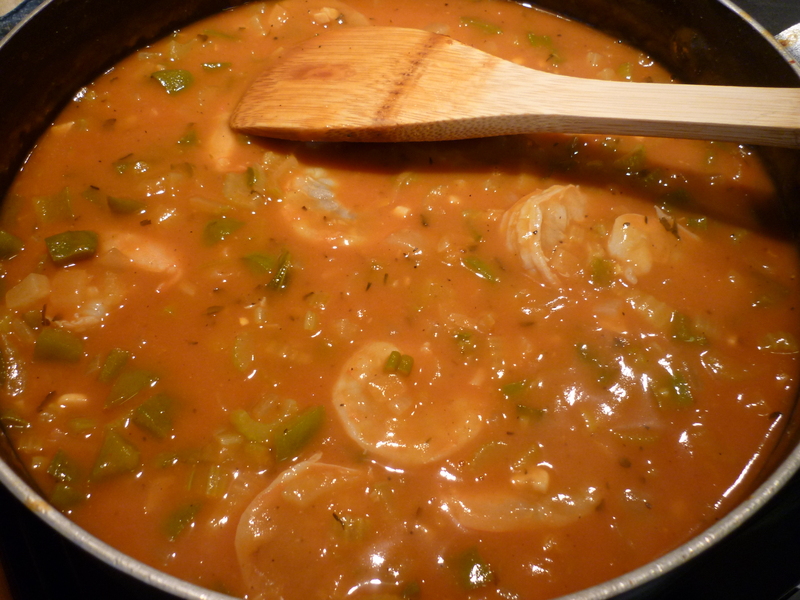 Add the shrimp and simmer for 15-20 minutes, uncovered. The flavor was heavenly. 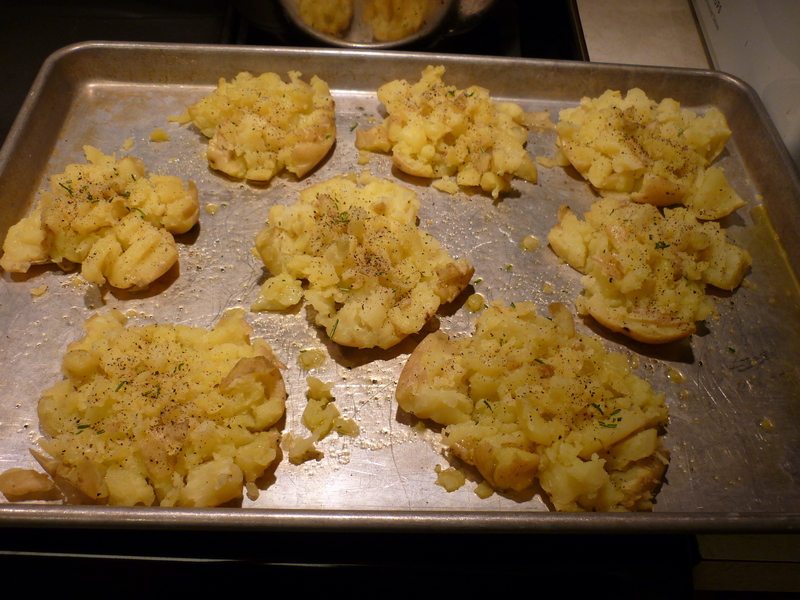 Along with all the stuff going on atop my range, I also made Twice-Baked Cauliflower from Kalyn’s Kitchen and Crash Hot Potatoes from the Pioneer Woman. The meal was awesome! 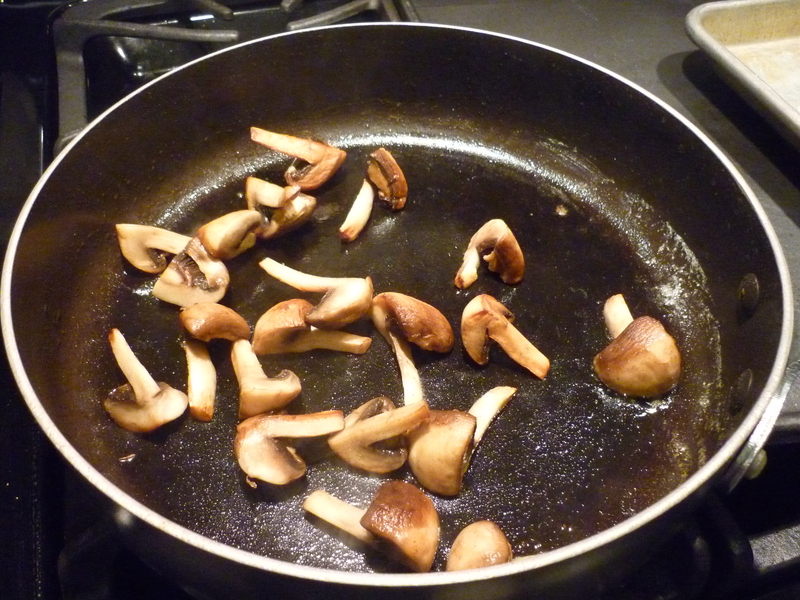 Cut medium-size mushrooms into quarters and brown in butter and olive oil. Set aside. 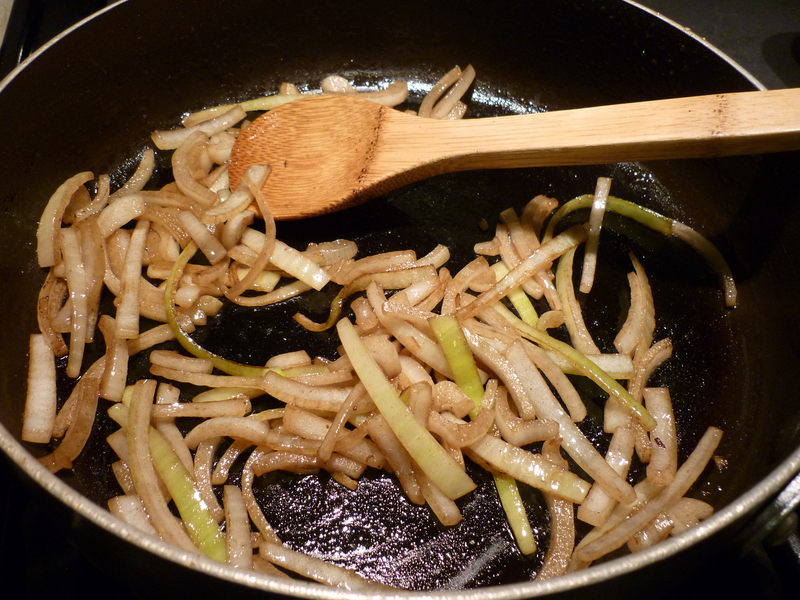 Using the same skillet, brown sliced onions. 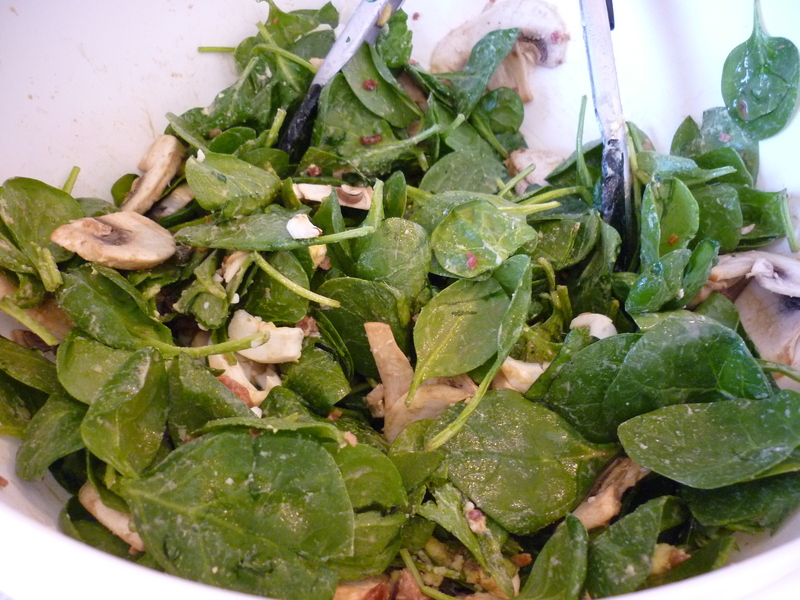 Add to mushrooms and set aside. 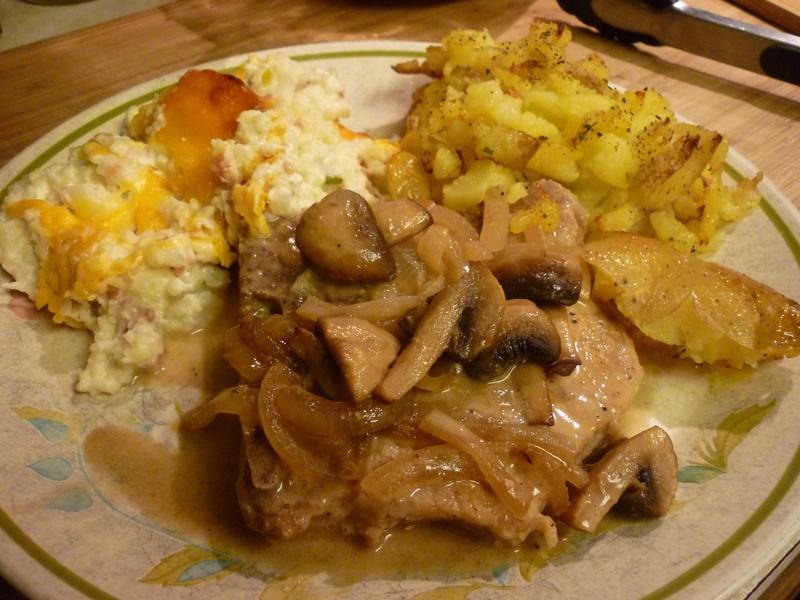 Using same skillet, brown seasoned pork chops. 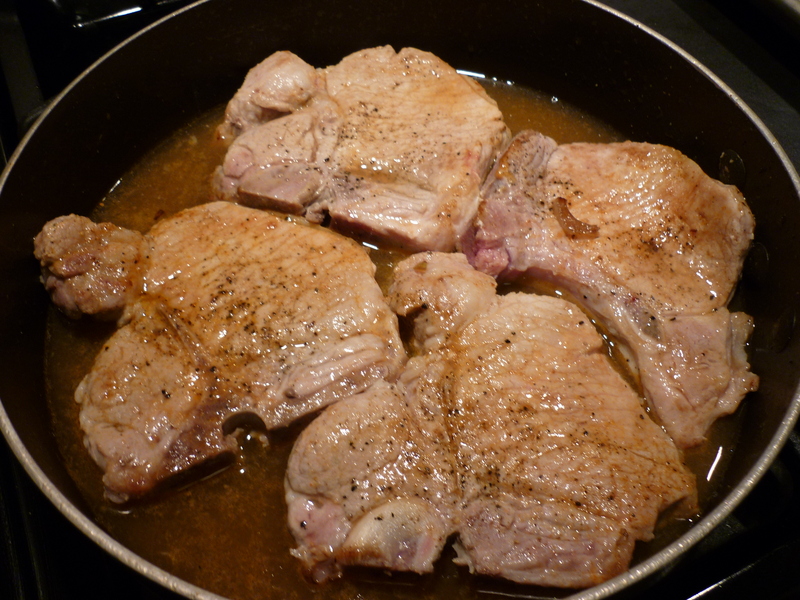 Remove chops from skillet and set aside. Deglaze the skillet with white wine, scraping the crispy bits up from the pan. 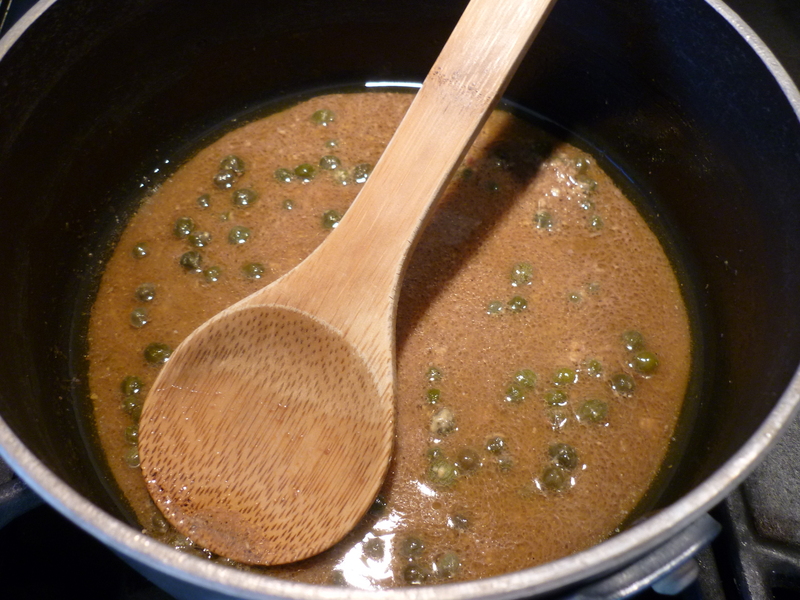 Let wine simmer and reduce for a few minutes. 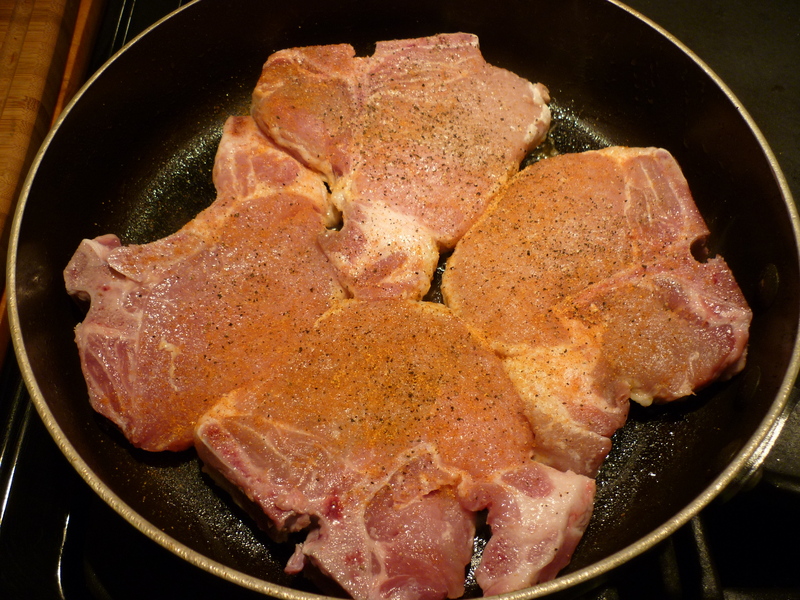 Add pork chops to pan. 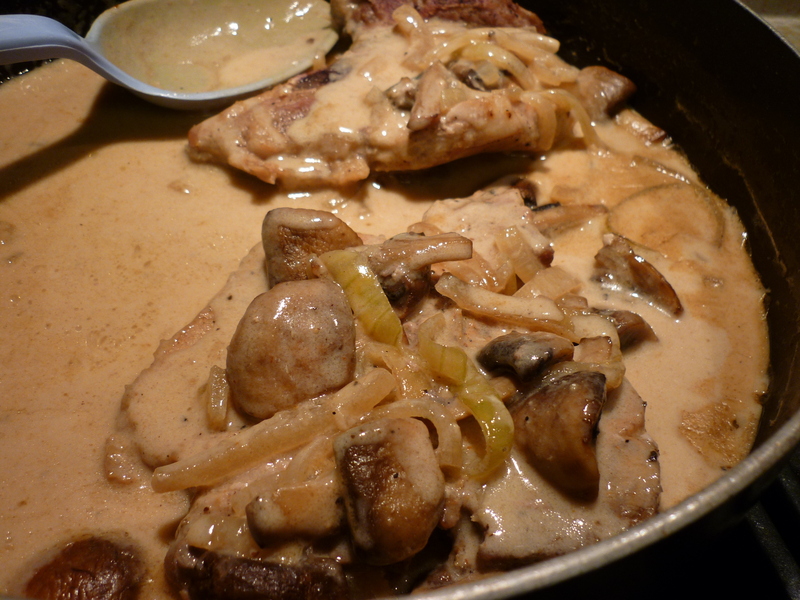 Add sauteed mushrooms and onions. Let simmer until pork chops are cooked. It won’t take long. Remove chops and set aside. 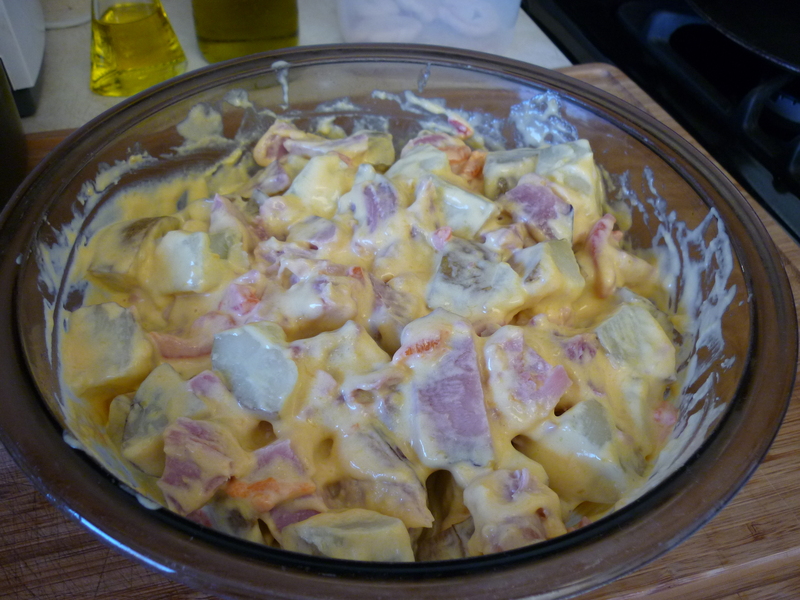 Add about ½ cup sour cream to skillet and stir until well mixed. 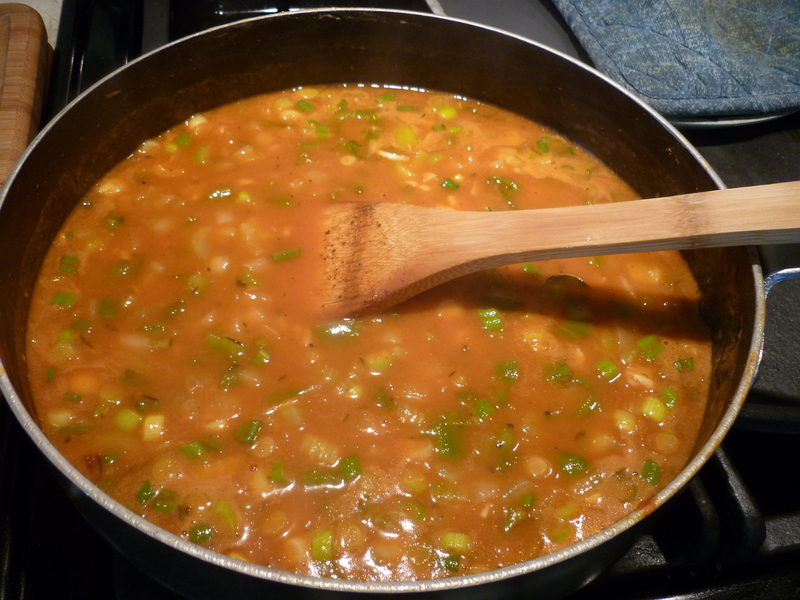 Let simmer to reduce a bit. 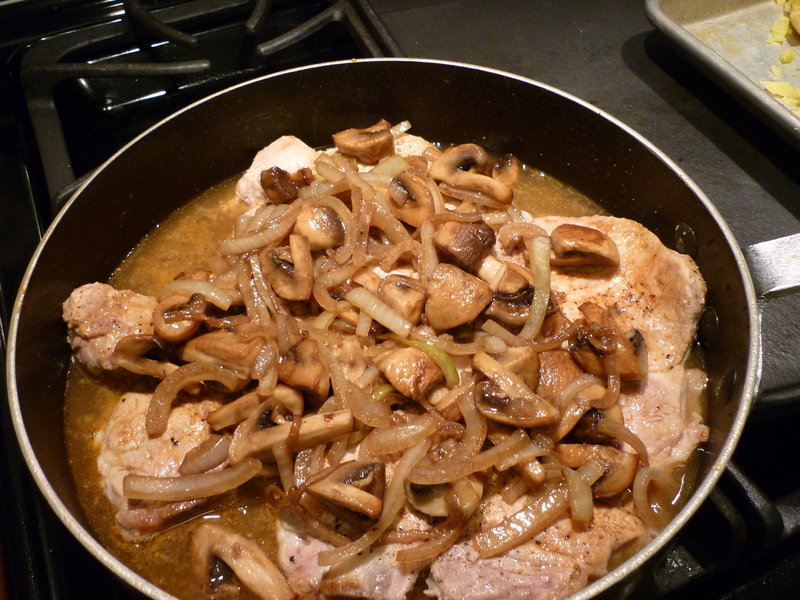 Add pork chops back into skillet and cover with sauce. Serve. Here’s the quick & easy info on Crash Hot Potatoes by Pioneer Woman . 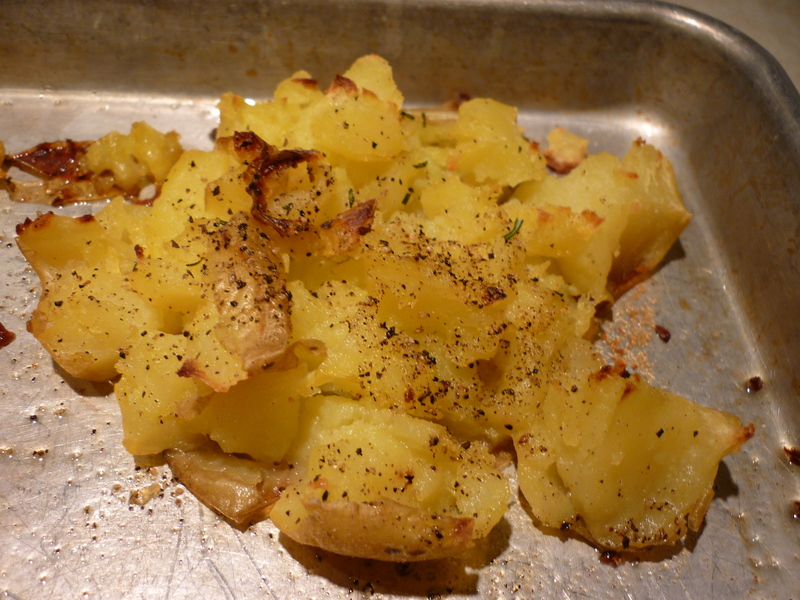 . . 1-Cook small potatoes. 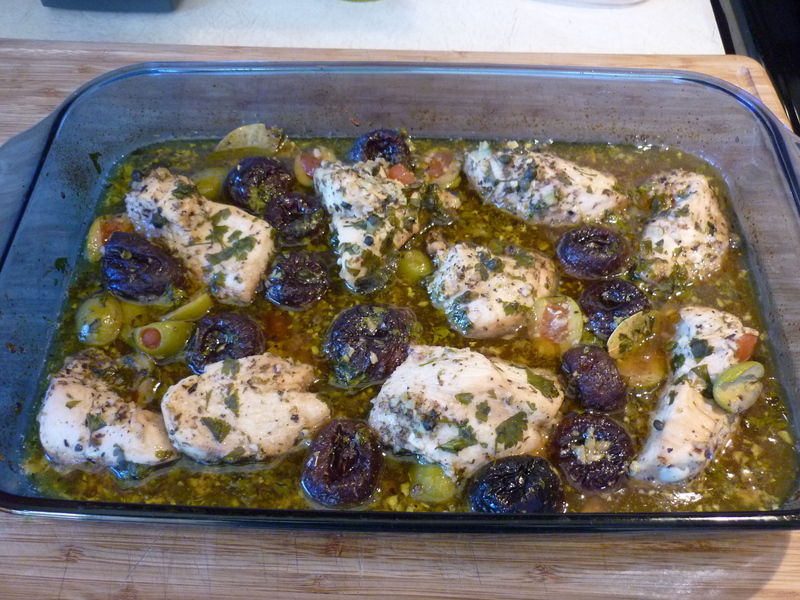 2-Place on baking sheet coated with olive oil. 3-Smash each potato. 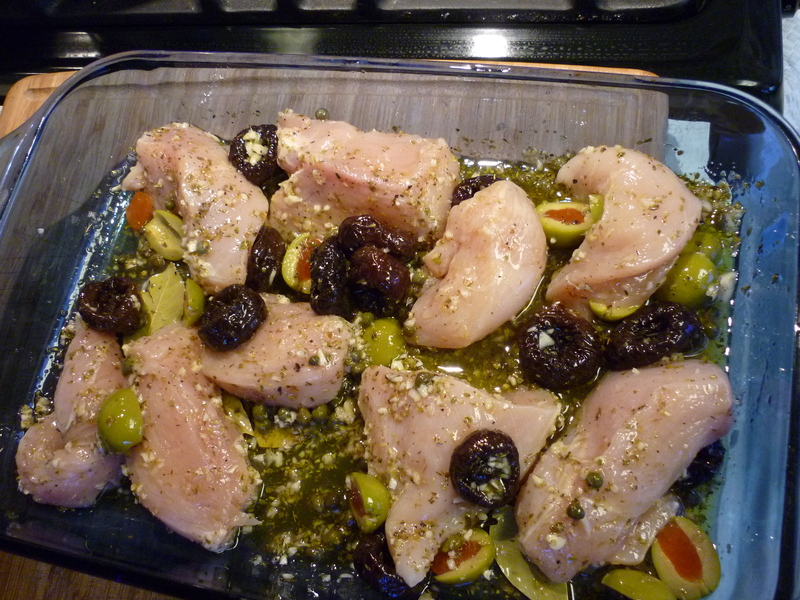 4-Sprinkle with salt & pepper & olive oil. 5-Bake 450 degrees 20-25 minutes till crispy on the top. They are really, really yummy. This was a standard dish at our house while I was growing up. I’ve tweaked it to make it my own. 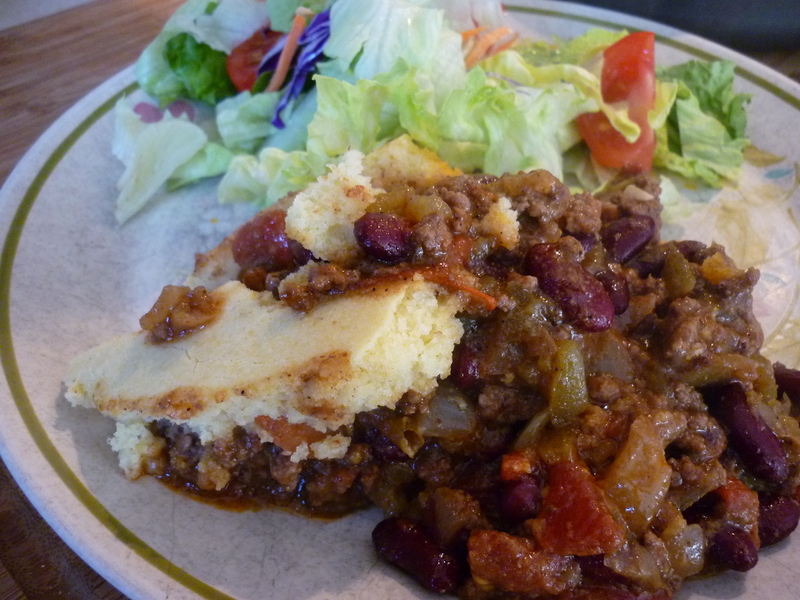 Many people buy a prepared cornbread mix to use, but it’s so simple to whip up a half-batch of cornbread that I don’t see the point in buying the mix. Also, I’ve started making my own taco seasoning and if you want to do that too, you can find a recipe online. Fry ground beef, onion, and garlic together in oven-proof skillet. 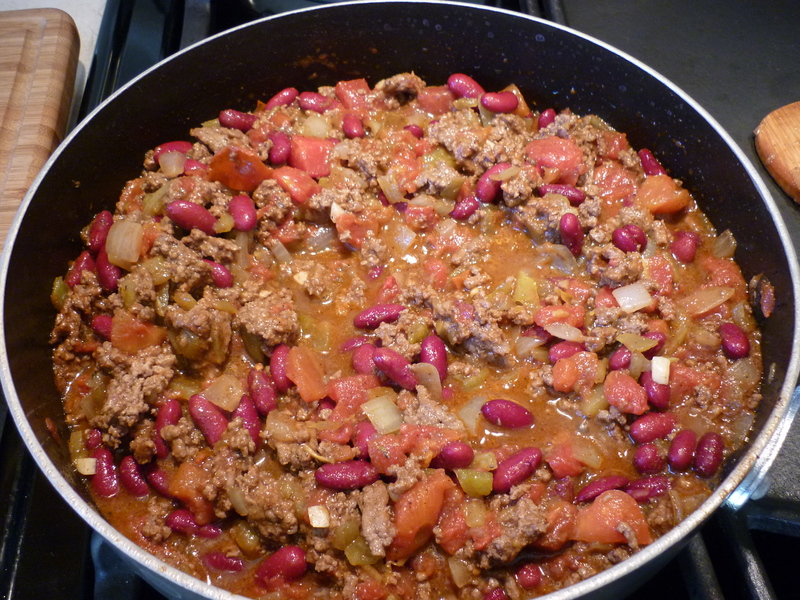 Stir in tomatoes, chiles, beans, and taco seasoning. Let simmer for a few minutes. 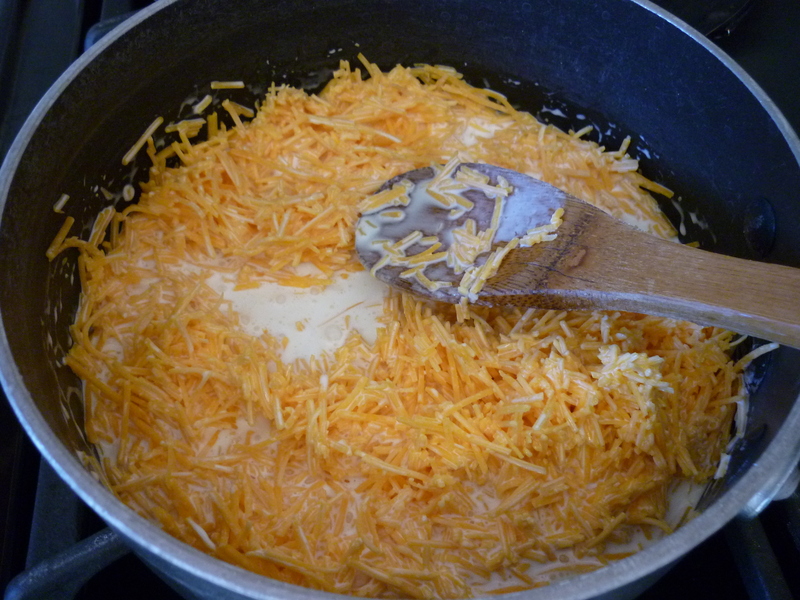 Remove from heat and stir in a handful of grated cheese. In a mixing bowl, stir together flour, corn meal, sugar, baking powder, and salt. 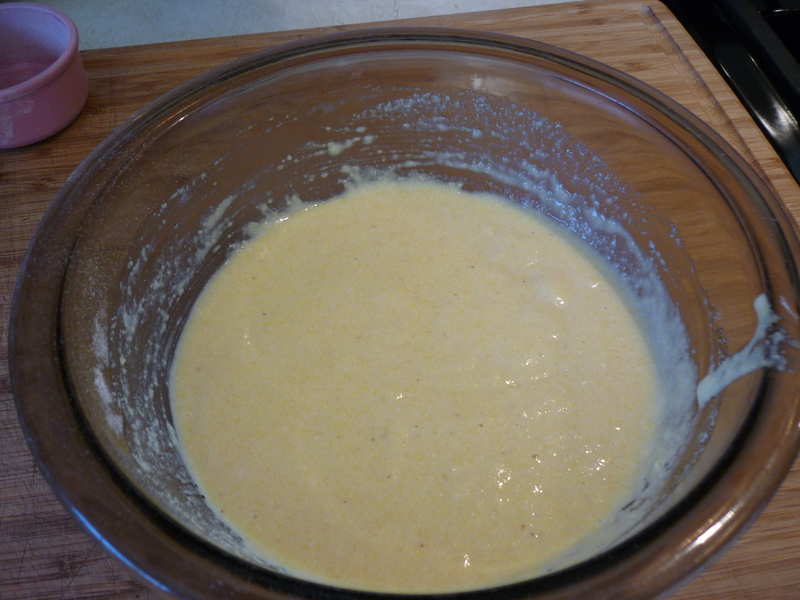 In a small bowl, mix milk, oil, and egg. Stir milk mixture into flour mixture and stir just until blended. 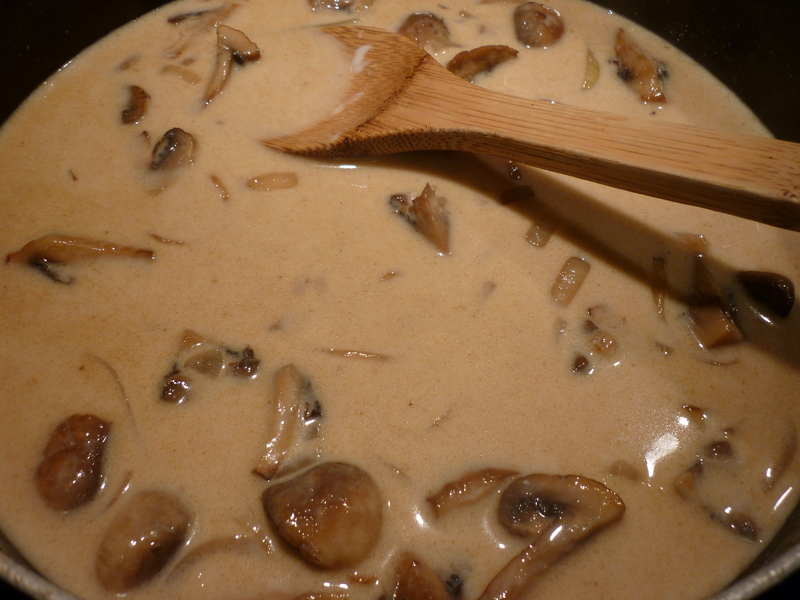 Pour this batter over the top of the ground beef mixture as pictured. 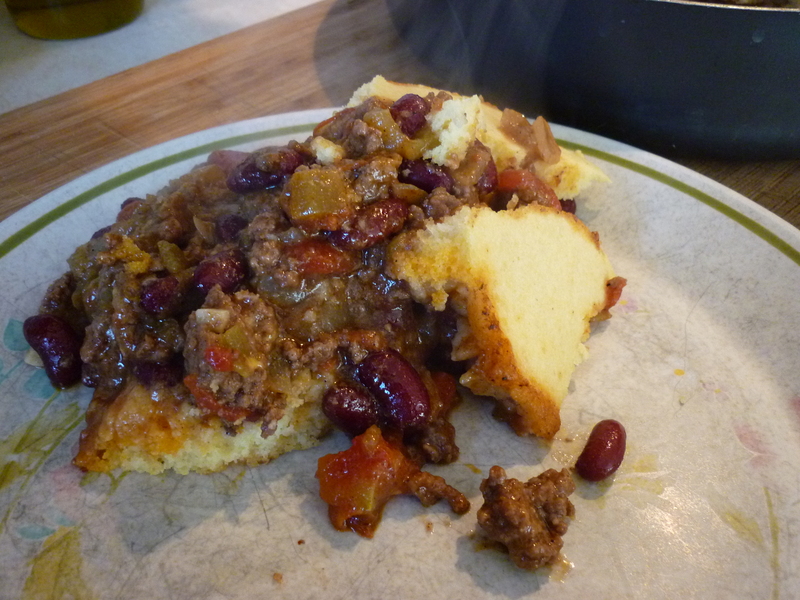 If you do not have an oven-proof skillet, you can use a greased 9×13” pan to place the cooked ground beef mixture and then pour the corn bread batter over the top. Bake at 400 degrees for 20 minutes. Serve. 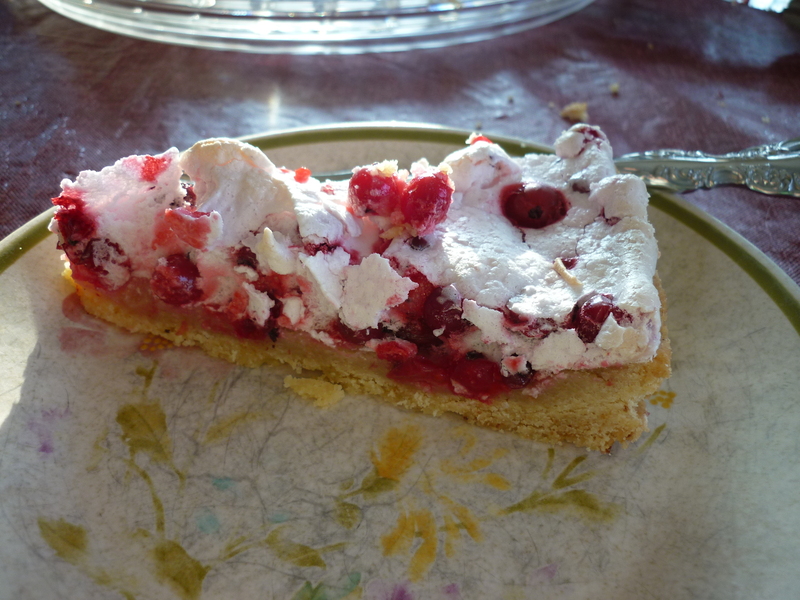 This was simple, it tasted good, and I will try it again should I come into red currants like I did last year. 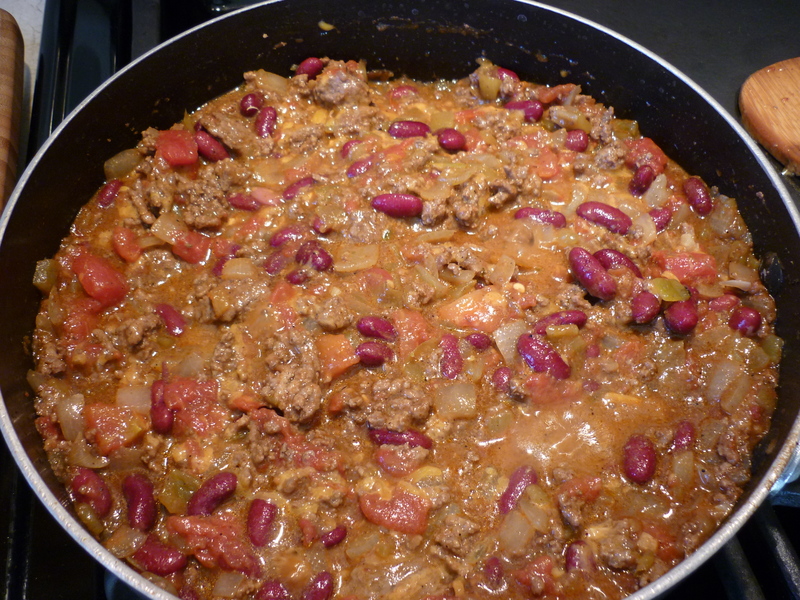 The recipe is based upon this one at allrecipes.com. I had some trouble with the crust sticking to the bottom of my springform pan and it took a lot longer to brown the meringue than I thought it would, but all in all, I call this one a win. Note to self: It’s just occurred to me that a better way to make the crust might be like the crust of lemon squares, where you cut the cold butter into the flour mixture and pat it into the pan. The butter isn’t very well incorporated into the flour, but it works. I believe you would come out with a more cookie-like crust that wouldn’t stick. Yes, I think that would work better. Okay, talking to myself, for next time! 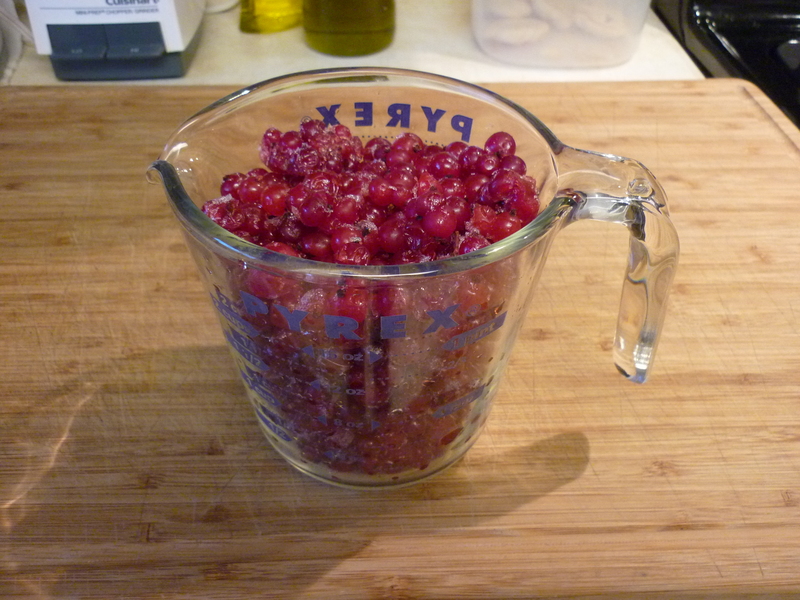 I pulled red currants out of my freezer and measured 2-1/4 cups, then let them thaw completely. Set aside. 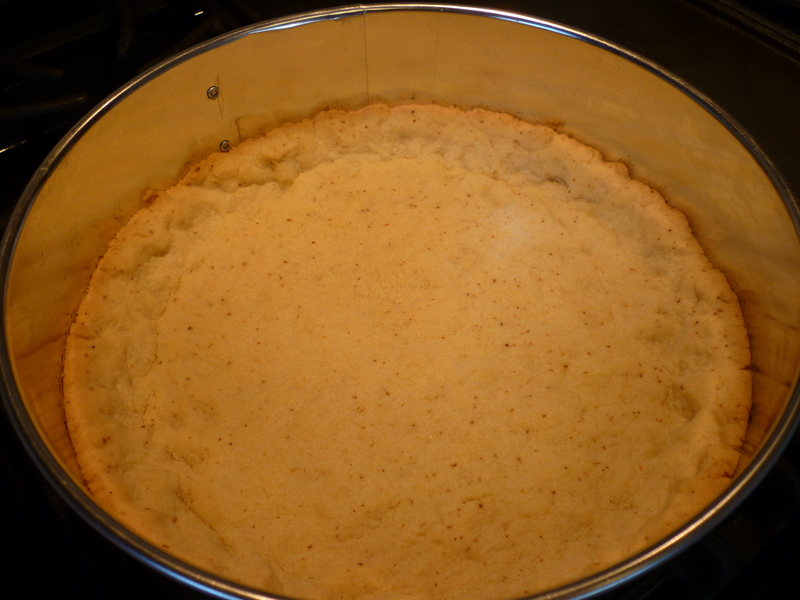 To make the crust, cream ½ cup butter with ½ cup sugar and 1-1/2 tsp. lemon zest. (Out of lemons, I used 1-1/2 tsp. of dried lemon peel.) Add two egg yolks and mix. Stir in 1-1/2 cups flour and 1 tsp. baking powder. 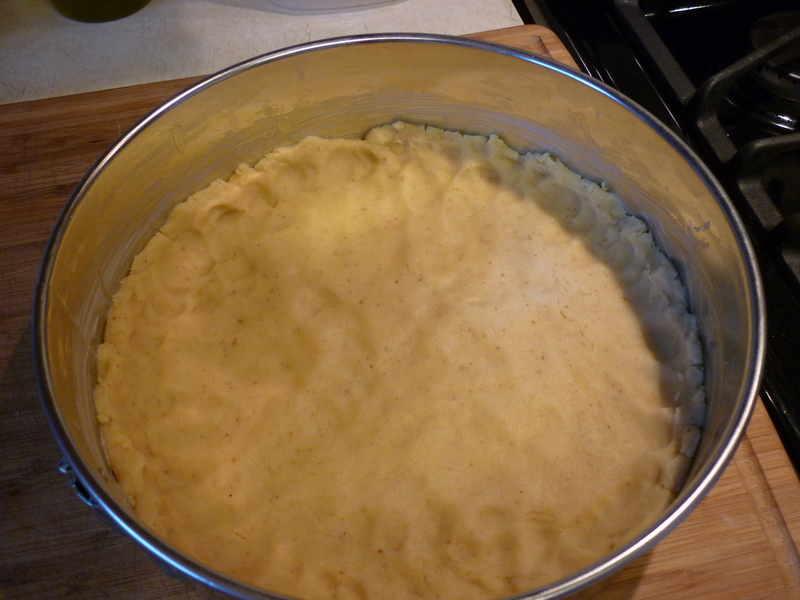 Work the dough until it holds together and press into a well-buttered 10” springform pan. Chill for 30 minutes. Bake at 325 degrees for 25 minutes or until golden yellow. 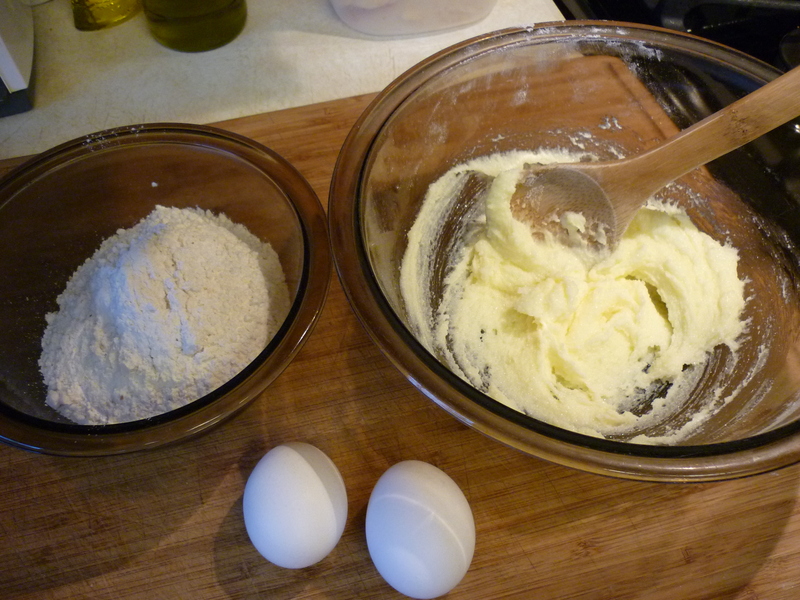 To make the filling, whip 2 egg whites until stiff. Gradually add ½ cup sugar and 2 tsp. cornstarch. Continue to whip until well incorporated. 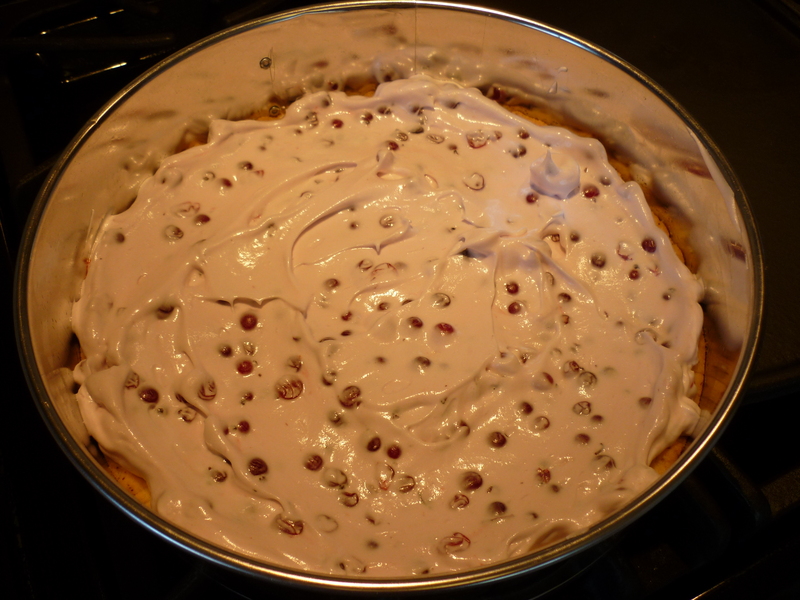 Drain the currants through a colander and gently fold into whipped egg whites mixture. 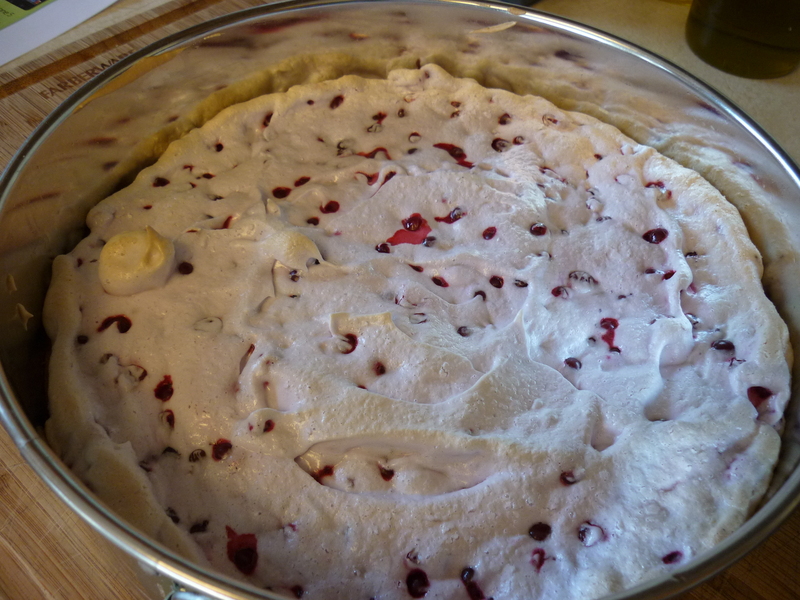 Spread filling atop crust and bake for 20 minutes or until top is lightly browned. 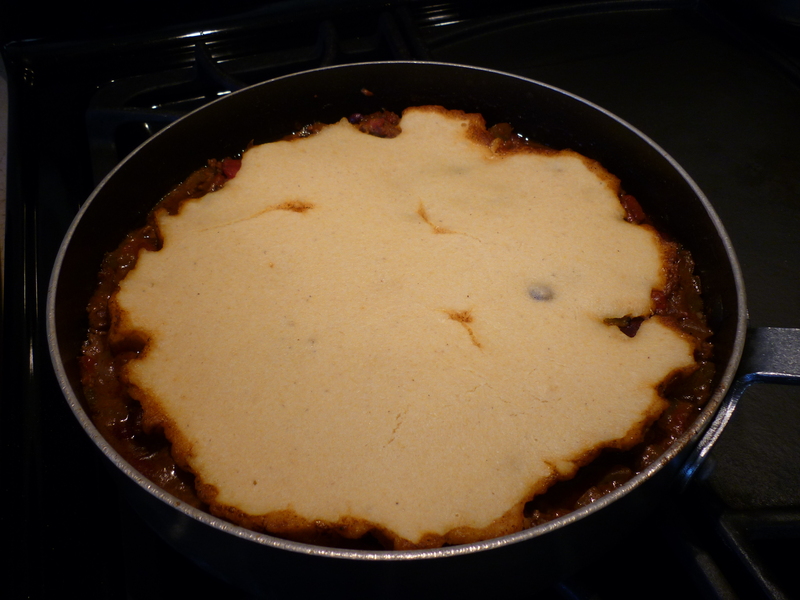 Let cool completely before sliding a knife around the edge and wrangling the tart out of the springform pan. Everyone really liked the taste, not too sour, not too sweet. This is our ultimate comfort food. It is so, so good! 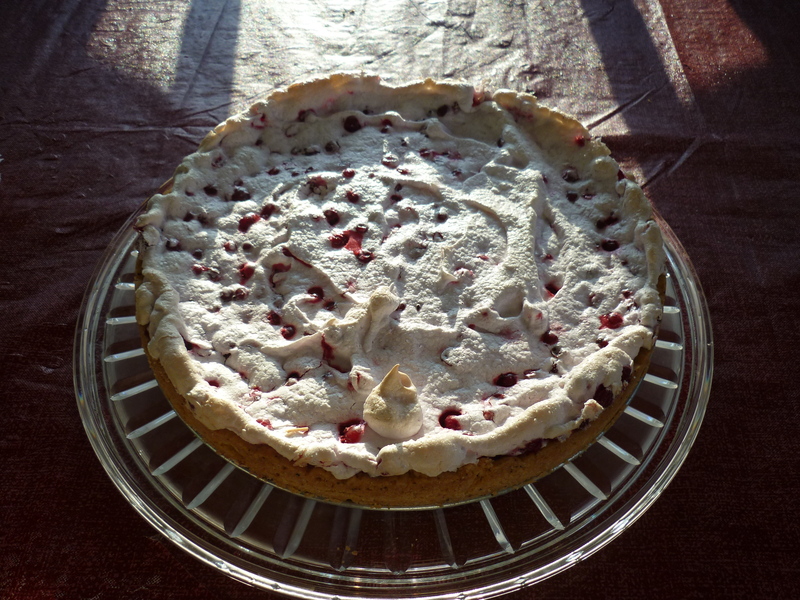 This recipe is based upon one found in Betty Crocker’s Cookbook (1969). 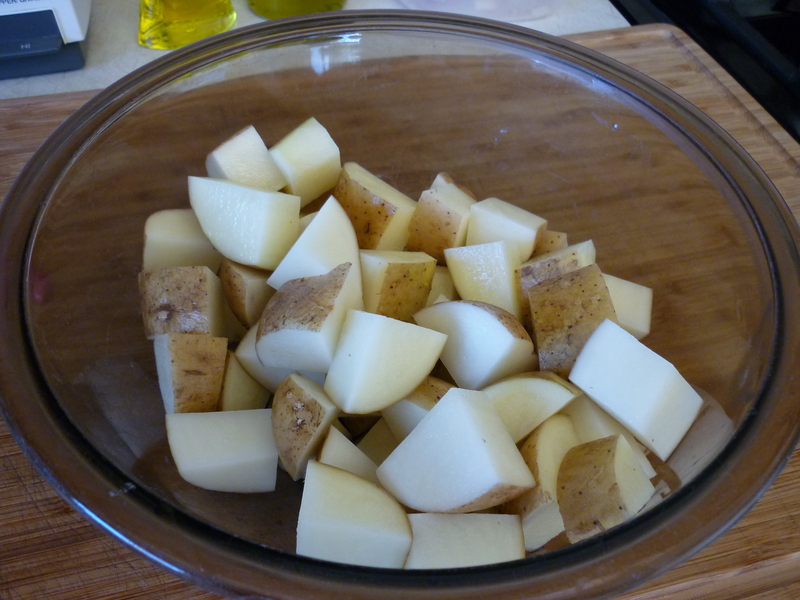 Cut potatoes into 1” dice to make four cups and cook them. 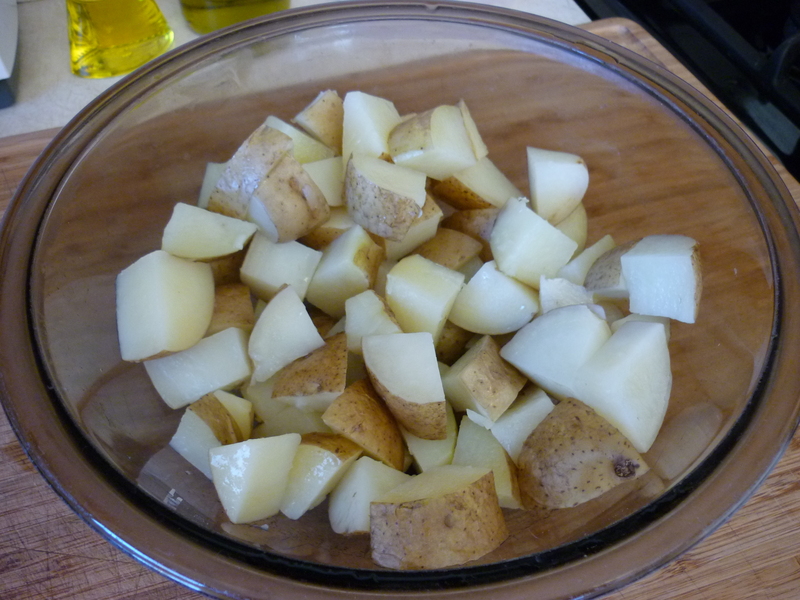 I cover the bowl of diced potatoes and microwave for about 3 minutes, shake them around, microwave another three minutes, shake, and then 3 more minutes. So, microwave for about nine minutes total. But you may cook the potatoes however you choose, just don’t make them too soft. Dice cooked ham into 1” to make four cups. 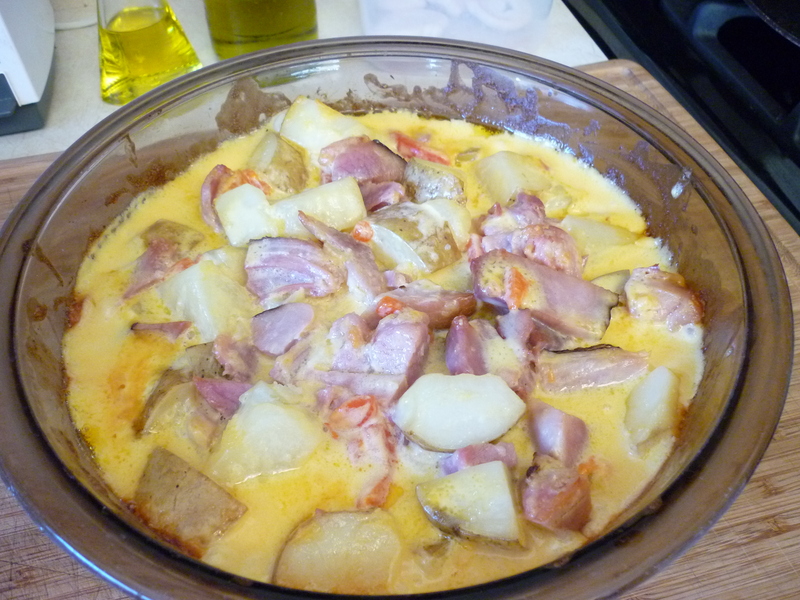 Mix with potatoes. 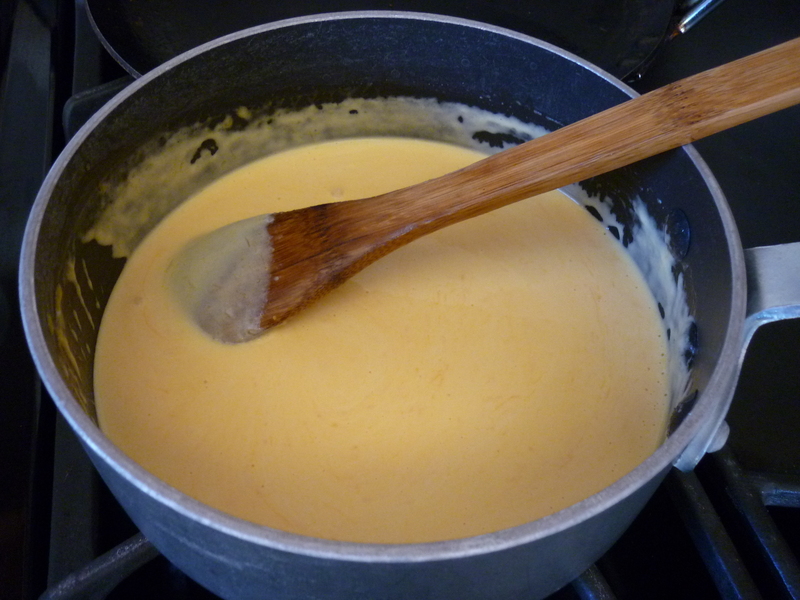 In a small saucepan mix 1 cup cream with 2 cups shredded sharp cheddar cheese. Heat and stir until cheese is melted and sauce is creamy. 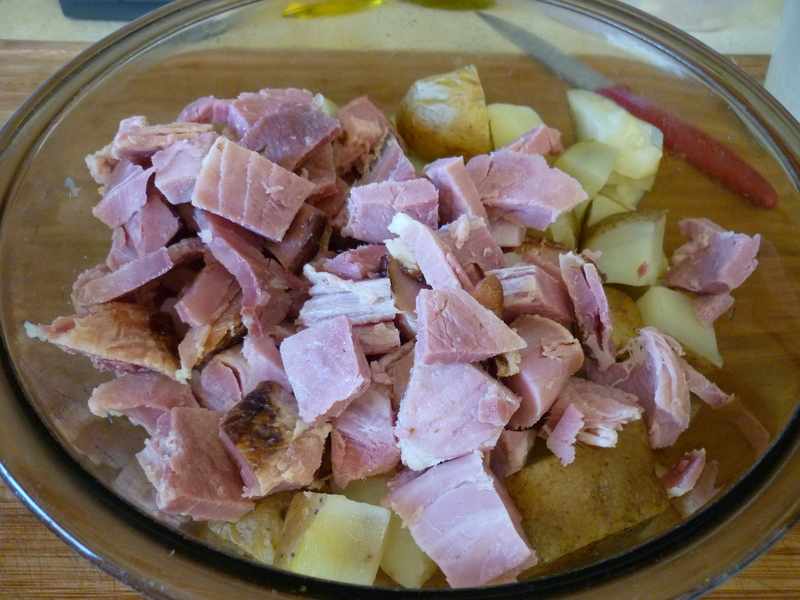 Remove from heat and stir into potatoes and ham. Stir in 4 ounces of sliced pimiento. Pour into an ungreased 3-qt. baking dish. 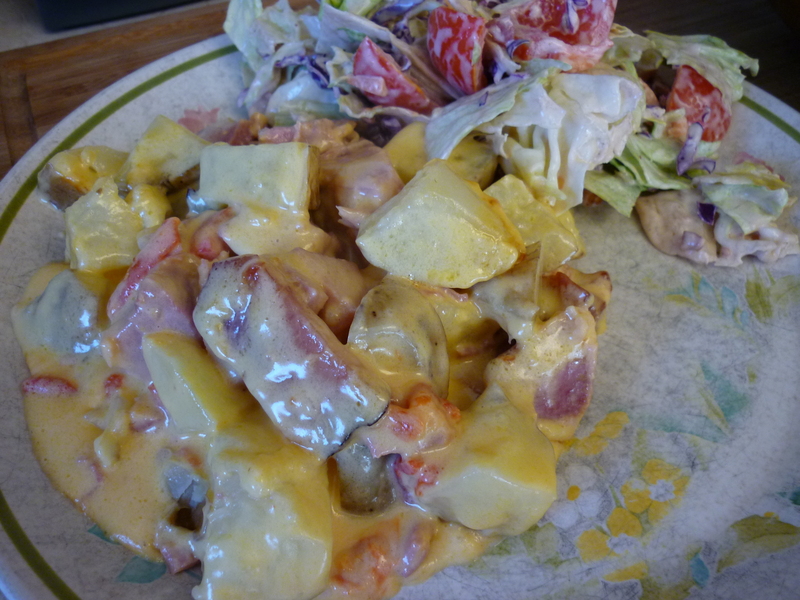 I use the same dish to cook the potatoes, mix the casserole, and then bake it. Cover and bake at 350 degrees for 45 minutes. 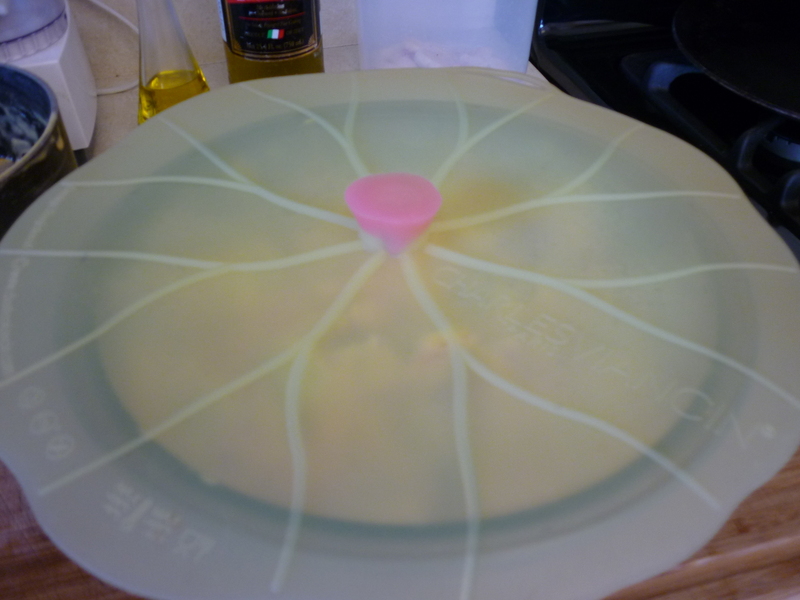 I cover with my cute silicon cover which works in the microwave and the oven and then the dishwasher. 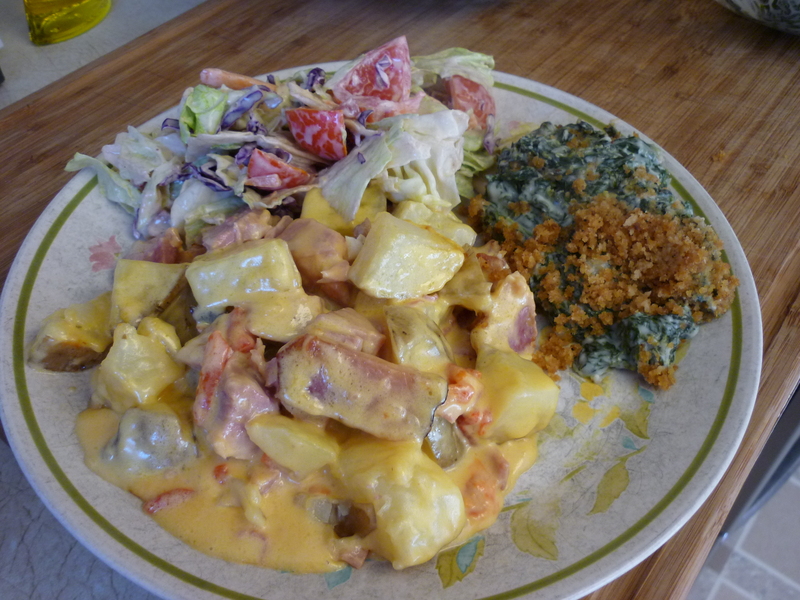 I served today with BLT Salad and Creamed Spinach. Lots of comfort! 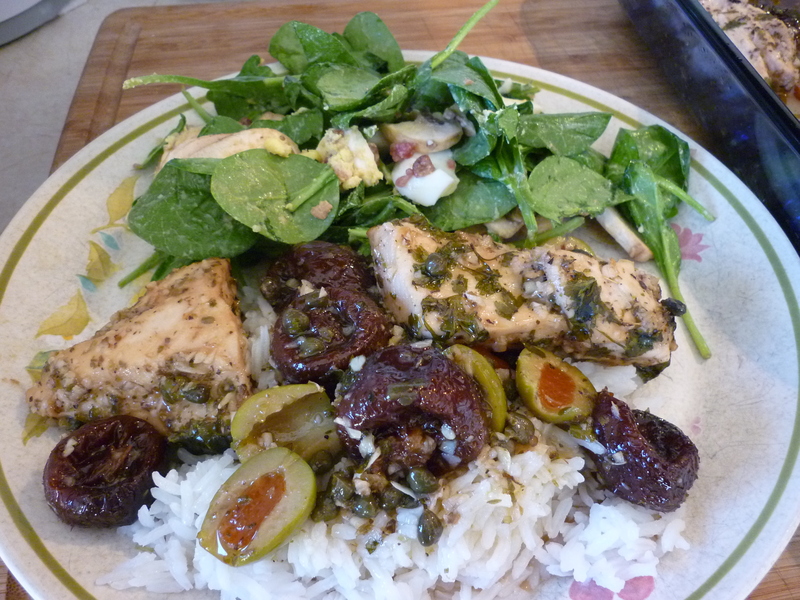 This recipe is one I have made for years. 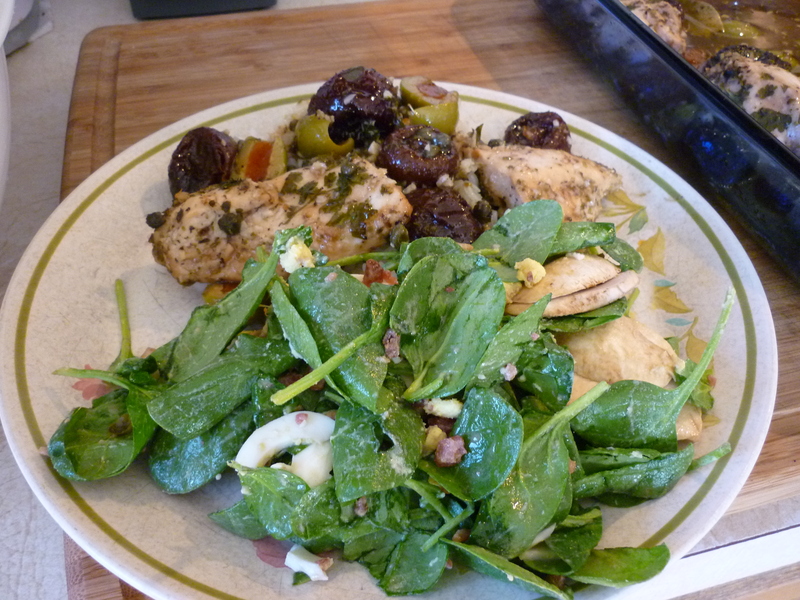 The basic recipe called for four cut-up chickens, but I have never served that many people or used cut-up chickens. 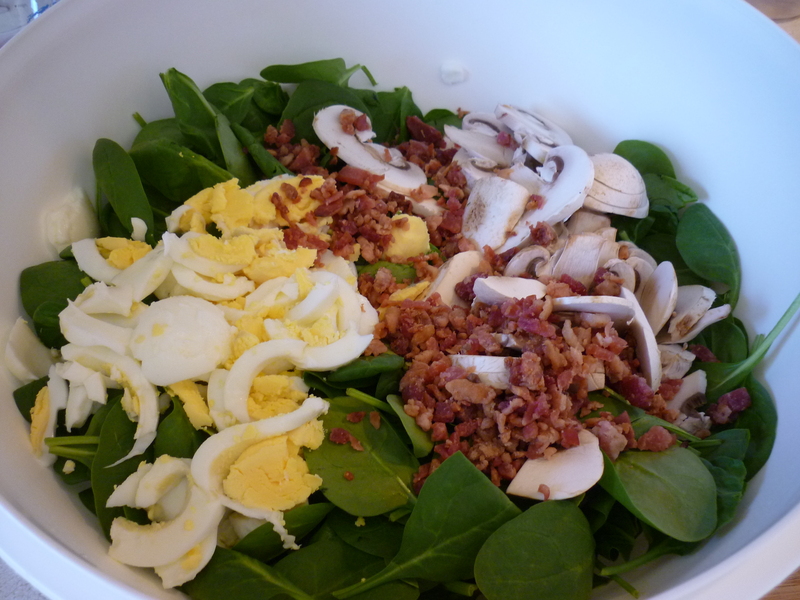 The beauty of this is that you can easily expand the recipe to serve a lot of people. I’m going to tell you how I do this for three or four of us, but the ingredient amounts are not specific. Eyeballing it will work just fine. 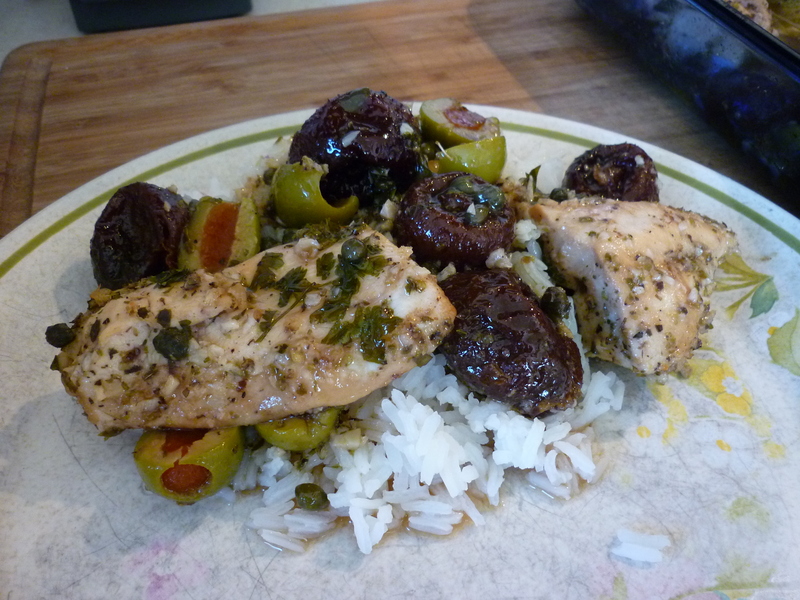 The quantity of garlic and oregano seems excessive, but it really works. This is a delicious dish. Start the night before or no later than six hours ahead. Scroll to the bottom for approximate measurements. Add boneless, skinless chicken breast, cut into serving sizes. Turn the chicken so it’s well coated and everything is mixed. Let marinate, refrigerated, overnight. 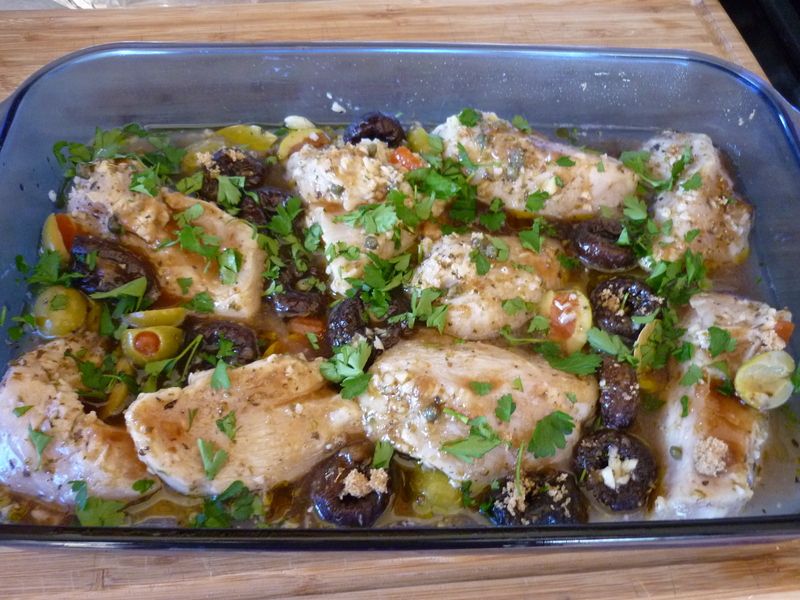 Remove from refrigeration and sprinkle brown sugar, white wine, and chopped parsley over the top. Bake, covered, for about 45 minutes at 350 degrees. Uncover and bake another 15 minutes. 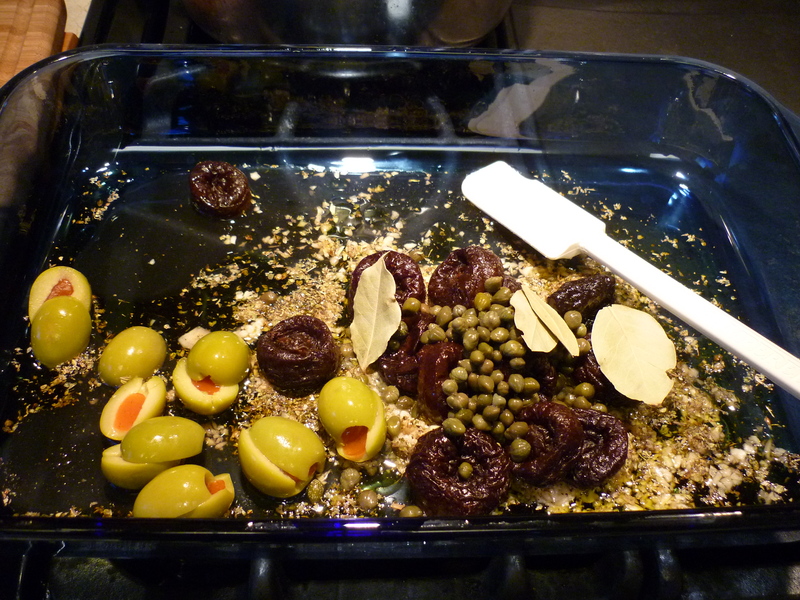 The night before, mix all together, except brown sugar, wine, and parsley in a 9×13″ baking dish. Let marinate overnight in refrigerator. Sprinkle with brown sugar and wine and parsley. Bake covered at 350 degrees for 45 minutes. 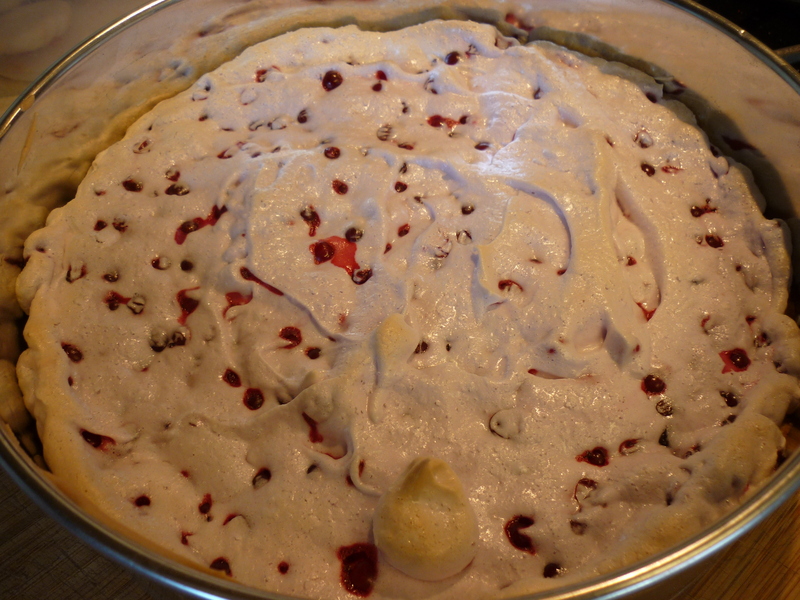 Uncover and continue baking for fifteen minutes more. Serve over rice.